Don't let a rainy day ruin your barbecue plans; let your crock pot come to the rescue! A slow cooker is an excellent option for a barbecue, especially when the weather is too wet or too cold to fire up the grill. Though the slow cooker is an excellent option for all parts of the chicken, legs, thighs, and wings are the most forgiving; they stay moist and juicy even after long, slow cooking. If you are cooking chicken breasts in the crock pot, just remember to check them for doneness about 1/2 hour to 1 hour earlier than the recipe recommendation. Like any lean meat or poultry, chicken breasts can become quite dry when overcooked. The minimum safe temperature for chicken and other kinds of poultry is 165 F.
For pulled or shredded chicken, thighs or a combination of boneless chicken breasts and thighs are ideal. When slow cooking wings and bone-in chicken parts, avoid overcooking unless you want the meat to be falling off the bone. 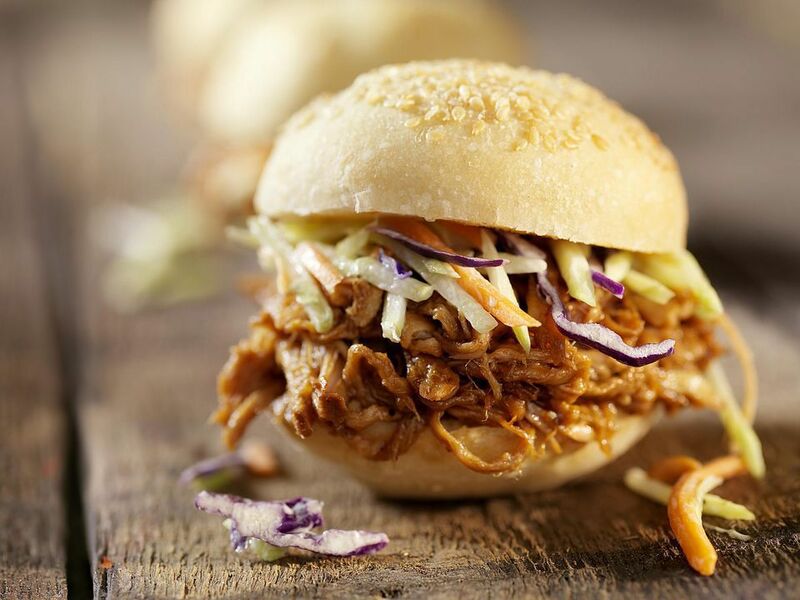 Here are some of our favorite barbecue chicken recipes for the slow cooker, including pulled and shredded chicken for sandwiches, chicken meatballs, and recipes using bone-in chicken parts. 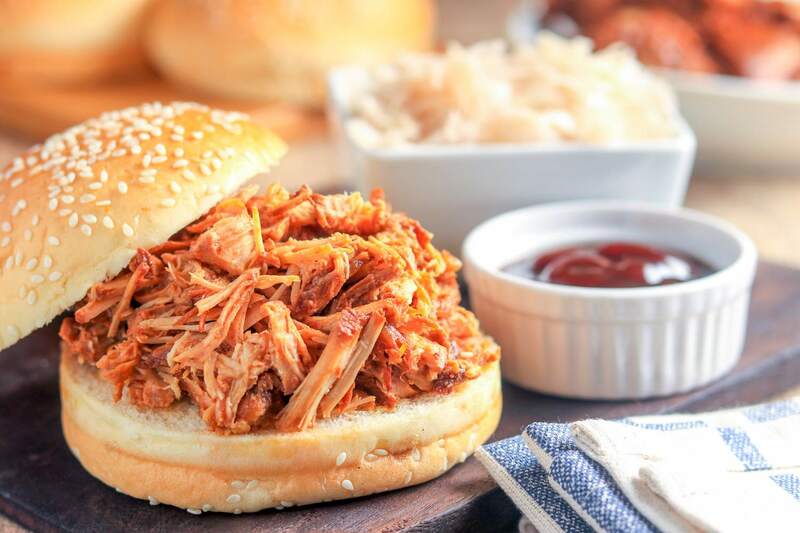 This moist pulled chicken is a snap to fix with the sweet and tangy homemade barbecue sauce. Boneless chicken breasts and thighs team up in this recipe; the thighs keep the chicken moist and flavorful while the chicken breasts keep it relatively low in fat. Some of the sauce is saved for serving. The chicken is shredded and piled onto buns. Drizzle with the extra barbecue sauce and top the chicken with dill pickle slices and a few spoonfuls of coleslaw. Make sure you provide napkins—or better yet, moist towelettes—when you serve this delicious sticky chicken. Brown sugar, honey, and ketchup make up the sauce along with seasonings. Sticky chicken is an excellent dish for a game day event or kids' party. Chicken breasts are used to make this shredded barbecue chicken. Barbecue sauce and onions go into this delicious chicken dish, and the slow cooker makes it a snap to fix and cook. Chicken parts are featured in this slow cooker dish. Cola and ketchup team up to make the sauce for this basic crock pot chicken. For barbecue flavor, add a tablespoon of Worcestershire sauce and a teaspoon of liquid smoke to the sauce mixture. These homemade meatballs, made with ground chicken thighs, are another excellent choice for the crock pot. The meatballs stay moist and juicy, and the spiced sauce mixture flavors them perfectly. Serve the meatballs over rice or noodles, or scale the recipe up and serve them as an appetizer. This saucy, sticky chicken is a flavorful combination of lean chicken breasts and a spiced brown sugar and honey sauce. The homemade barbecue sauce for this shredded chicken is surprisingly easy; and it contains only six ingredients. The chicken makes delicious sandwiches, and it's easy to scale up for a crowd. Chicken thighs are an excellent choice for the crock pot because they stay moist and flavorful even after long, slow cooker. While chicken breasts tend to dry out, thighs remain juicy. This recipe pairs chicken thighs with thick barbecue sauce and simple spices for amazing sandwiches or sliders. These drumettes are a simple preparation, and they can be served right from the slow cooker. The prepared barbecue sauce—choose a commercial sauce or homemade—is amped up with some chili sauce, honey, and garlic. Chicken parts are slow cooked to perfection in this all-in-one meal. Barbecue sauce flavors the seared chicken pieces. The sweet potatoes are halved and wrapped in foil, which will ensure that they cook thoroughly and don't break down in the sauce. Serve this dish along with a salad or greens for a satisfying family dinner. If you're looking for an enticing homemade barbecue sauce for your chicken, look no further. This sauce is especially good with shredded chicken. These step-by-step instructions are especially helpful if you're a beginning home cook. Boneless chicken breasts and thighs team up in this recipe. All you need are the chicken, the slow cooker, an onion, and a bottle of barbecue sauce. What could be easier? A spice rub gives these chicken pieces grilled flavor without the heavy sauce, and searing them ahead of time adds texture and color. If you like sauce, brush some on the chicken parts just before they're ready and serve more sauce at the table. The recipe calls for thighs and drumsticks, but chicken wings, whole legs, and drumettes are good alternatives. Chicken drumsticks, drumettes, or whole legs are a breeze to fix and cook with this 3-step recipe. If you substitute with boneless thighs or chicken breasts, reduce the cooking time by about an hour. Feel free to "doctor" the sauce with the addition of some crushed red pepper flakes, liquid smoke, or hot sauce. This crock pot dish calls for large turkey legs, but feel free to use whole chicken legs in the dish instead. The homemade "island-style" barbecue sauce includes brown sugar, pineapple, and optional liquid smoke.